Several cafes and all of the meeting rooms located in the north wing of Tresidder Memorial Union will be closed during the summer while Stanford replaces two of the building’s aging heating, ventilation and air conditioning (HVAC) units. “The units are original to the building, which opened in 1962, and there was a strong chance that they would fail during the next three to five years, so we decided it was better to be proactive and replace them before they failed unexpectedly,” said Kathleen “KB” Baldwin, a facilities manager who oversees the campus zone in which Tresidder is located. Currently, construction fencing surrounds the north wing of the building, including part of the outdoor dining patio that faces White Plaza. Signs – in Cardinal red – have been posted around Tresidder to direct visitors to the cafes, businesses, administrative offices and ATMs that will remain open during the construction project. The staircase on the north side of the building, opposite Old Union, will remain open during the summer. The cafes that will remain open are Jamba Juice, CoHo, Starbucks and The Treehouse. Also open is Tresidder Marketplace, a convenience store that faces the patio near the Stanford Humanities Center and Faculty Club. The eateries closed for the summer are Basils, Fraîche, Kikka Sushi, Heirlooms Farmers Market Salads, Panda Express and Subway. Stanford Hospitality & Auxiliaries has posted a list of the Summer 2016 hours of its campus cafes. For a list of other cafes and eateries around campus, visit the Stanford Visitor Information website. Please contact the individual businesses for summer hours. 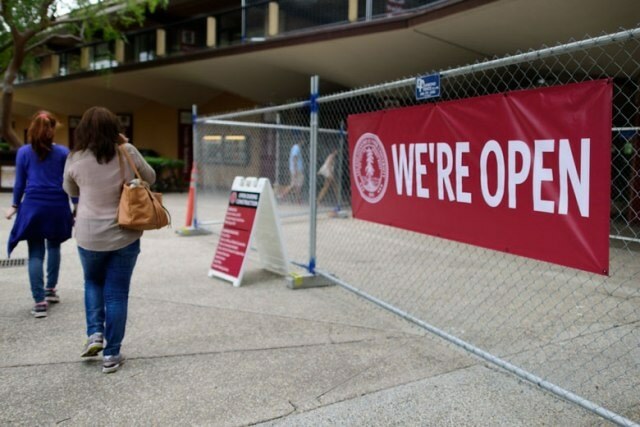 The businesses that will remain open during the construction project are Bank of America’s ATM, the Campus Bike Shop, the FedEx Business Office Center, Stanford Hair, the Stanford Federal Credit Union and its ATMs, the Stanford Store, and Wells Fargo Bank and its ATMs. All of the university’s administrative offices located in Tresidder will remain open: the ID Card Office, which has been temporarily relocated to the Student Services Center; Residential Education; the Office of the Vice Provost for Student Affairs; the Office of Community Standards; the Office of Military-Affiliated Communities; Student Services; the Ticket Office; and Tresidder Meeting Services. Tresidder’s meeting rooms on the second floor, including Cypress, Laurel, Oak and Sequoia, will be closed for the summer. The north wing of Tresidder is expected to reopen by Sept. 20 for New Student Orientation.